When we fall in love, suddenly we see life in technicolor. We nibble each others’ ears and tell each other everything; our limitations and rigidities melt away. We’re sexier, smarter, funnier, more giving. Now we feel whole, we feel like ourselves, we areconnected. But inevitably–whether we marry or move in together– things just start to go wrong. The veil of illusion falls away, and it seems that our partners are different than we thought they were. It turns out they have qualities that we can’t bear. Even qualities we once admired grate on us. Old hurts are reactivated as we realize that our partners cannot or will not love and care for us as they promised. Our dream shatters and we feel disconnected. Disillusionment turns to anger. Since our partner no longer willingly give us what we need, we change tactics, trying to coerce our partners into caring–through anger, crying, withdrawal, shame, intimidation, criticism–whatever works. The power struggle has begun, and may go on for many years, until we split, or we settle into an uneasy truce, or until we seek help, desperate to feel alive and whole again, to have our dream back and feel reconnected. What is going on here? After reflecting deeply on this question, we have come to this conclusion: you have found an Imago (IH-MAH-GO) partner, someone, we regret to say, who is uniquely unqualified (at the moment), to give you the love you want. Well, this is what’s supposed to happen. Let us explain. We all think that we have free choice when it comes to selecting our partners. But our primitive “old” brain has a compelling, non-negotiable drive to restore the feeling of joyful aliveness and connectedness with which we came into the world. To accomplish that, it must repair the damage done in childhood as a result of needs not met, in a relationship with a person who resembles our caregivers. You’d think, then, that we would choose someone who had what our caregivers lacked–and of course this is what we unconsciously seek. If only that was so! But the old brain has a mind of its own, carrying its own image of the perfect partner, a complex synthesis of qualities formed in reaction to the way our caregivers responded to our needs. Every pleasure or pain, every transaction of childhood, has left its mark on us, and these collective impressions form an unconscious picture we’re always trying to match up as we scan our environment for a suitable mate. This image of “the person who will join with me and make me joyful and connecting again” we call the Imago. Though we consciously seek only the positive traits, the negative traits of our caregivers are more indelibly imprinted in our Imago picture, because those are the traits which caused the wounds we now seek to heal. Paradoxically, our unconscious need is to have our feelings of aliveness and wholeness restored by someone with the same deficits of care and attention that hurt us in the first place. So when we fall in love, our old brain is telling us that we’ve found someone with whom we can complete our unfinished childhood business, meet certain biological imperative, and recover our connectivity and experience of being joyfully alive. Our imperfect caregivers are “freeze dried” in the memories of childhood, are “reconstituted” in our partner. Unfortunately, since we don’t understand what’s going on, we’re shocked when the awful truth of our beloved surfaces. All of this seems to be a recipe for disaster, and for a long time this depressing state of affairs puzzled us. How can we resolve our childhood issues if our partners wound us in the same ways as our caregivers, and we ourselves are stuck in childhood patterns that wound our partners? Consciousness is the key; it changes everything. When we are unaware of the unconscious agenda of romantic love, it is a disaster, for our childhood scenarios inevitably repeat themselves with the same devastating consequences. There is method to this madness, though. The unconscious recreation of the ambience of childhood has the express purpose of bringing this old impasse to a resolution. When we understand that we have chosen our partners to heal certain wounds, and that the healing of those wounds is the key to the end of longing, we have taken the first step on the journey to real love. What we need to understand and accept is that conflict is supposed to happen. This is as nature intended it: everything in nature has a polarity and is in tension. The hard truth is that the grounds for marriage is really incompatibility; it is the norm for relationships. Conflict needs to be understood as a given, a sign that the psyche is trying to survive, to get its needs met and become whole, and paradoxically, to restore feeling connected. It’s only without this knowledge that conflict is destructive. Romantic love is supposed to end. It is the glue that initially bonds two incompatible people together to do what needs to be done to heal each other, and in the process, heal the rifts in nature caused by our wounds. The good news is that the power struggle is also supposed to end. The emotional bond that is created by romantic love to keep partners together through the hard times evolves into a powerful organic bond through the process of resolving conflict. A Conscious Marriage is not for the faint-hearted, for it requires learning more effective coping mechanisms than the crying or anger or withdrawal which have become so habitual for us. It means reconnecting through dialogue, stretching to give our partners what they need to heal. This is not easy, but it works. Regardless of what we may believe, relationships are not born of love, but of need; real love is born in relationships. You are already with your dream partner, but at the moment, he or she is in disguise–and, like you, in pain. A Conscious Marriage itself is the therapy you need to restore your sense of aliveness and connectivity, and set you on the path of real love. Our Gift for You. 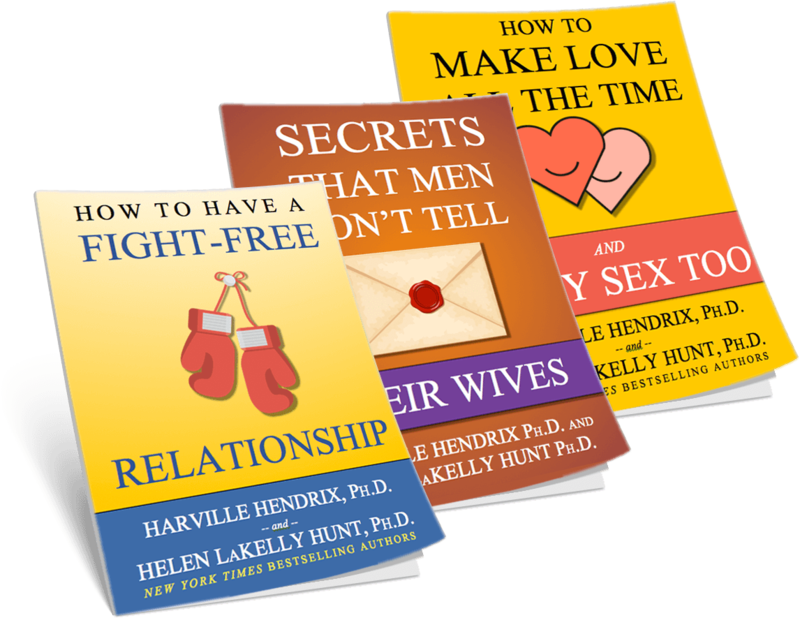 Get 3 Free Books! Sign up for our free newsletter filled with practical advice and insights to help you and your partner become the most connected couple you know!